This is a static snapshot of today - the version in the side column will be updated dynamically. It’s time once again to launch Electoral-Vote.com’s tracking widget — almost exactly four years to the day after it made its first appearance on my humble blog. For better or worse, we don’t have national elections in America. We have 51 state elections. Occasionally this matters a lot — just ask President Gore about his half-million-vote “national victory” in 2000. It takes 270 electoral votes to win, so if the election were held today, polls indicate Obama would win with 284 electoral votes (plus or minus 13, depending on Virginia, which currently is deadlocked). Looks like the Senate would be deadlocked at 49-49, with two seats too close to call. But the races can be volatile. 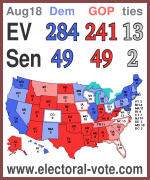 Four years ago this week, the same widget predicted 275 EV for Obama, 250 for McCain. 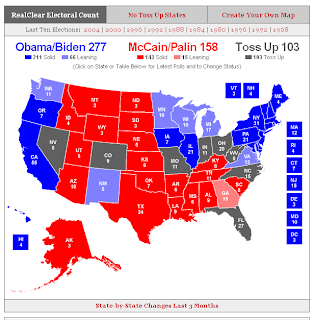 On Election Day, Obama actually won 365 electoral votes, more than twice McCain’s total of 173. This year on Nov. 6, the Web Goddess and I will cast presidential votes that are utterly meaningless — not just because we’ll cancel each other out, but also because there is zero chance that Romney will carry New Jersey. The states that matter most this year are Colorado, Florida, Iowa, Missouri, North Carolina, Ohio, Virginia and Wisconsin. As near as I can tell, every poll ever taken on the subject shows that an overwhelming majority of Americans think the Electoral College should be eliminated in favor of direct national elections. But don’t look for a Constitutional amendment any time soon — the amendment process is even more strongly skewed in favor of smaller states than the Electoral College itself. The National Popular Vote bill would guarantee the Presidency to the candidate who receives the most popular votes in the entire United States. The bill preserves the Electoral College, while ensuring that every vote in every state will matter in every presidential election. The National Popular Vote law has been enacted by states possessing 132 electoral votes — 49% of the 270 electoral votes needed to activate it. Interestingly, the big state vs. small state struggle doesn’t seem to come into play. Jurisdictions that have passed the NPV bill range from the smallest of the small — Vermont and District of Columbia, with three electoral votes each — to California, the biggest jackpot, with 55 electoral votes. No, the divide that matters is on red-blue lines. The other states that have enacted the bill include New Jersey (which managed to enact it in 2008 without me noticing), Hawaii, Illinois, Maryland, Massachusetts and Washington. Every single one of these states has gone to the Democratic candidate in each of the past five presidential elections, going back to 1992. Maybe the red-blue split has something to do with the fact that the only election in living memory that would have gone the other way in the absence of the Electoral College is Bush vs. Gore in 2000. The last time before that was Harrison vs. Cleveland in 1888. Neo-neocon sparked a raucous conversation in the comments of a brief post about the followup to a mischievous Zogby poll that surveyed Obama voters about their level of knowledge of various statements, and reported that the Obama voters surveyed got questions wrong more often than if they had simply guessed randomly. I say it’s a “mischievous” poll because it makes no sense to poll only Obama voters, there’s no context. So another polling firm went out and sort-of replicated the poll, but this time surveying random people (thereby capturing both McCain and Obama voters). I say “sort-of replicated” because they added a question to what Zogby asked, and a lot of the Zogby questions are arguably biased. (In fact, Neo’s commenters argue about this at great length.) Viewers of right-leaning Fox News and left-leaning MSNBC News scored differently on various questions, and there’s plenty to argue about there, too. Respondents were asked which party controlled both houses of congress before the past election, Republicans or Democrats. I want to be careful here, because the vast majority of my friends and neighbors voted for Obama. If I know you personally, I’m confident that you would have correctly answered “Democrats.” But the overall difference in political awareness between Obama and McCain voters is stark. So, let’s review: McCain supporters are better informed, and Obama supporters are celebrating. Advantage: Obama. Differences on policy issues should not, on this day, obscure the marvel that has occurred. A man who in his early childhood could not use certain public restrooms has just been elected to the most powerful office in the world. The 109-year-old daughter of a slave lived long enough to help elect a black president. There will always be toxic individuals, but it’s now permissible to hope that we may have seen “The End of Racism” as a potent force in our society. I voted for John McCain because I admire him immensely as a person, and agree with him on many more issues than I do with Senator Obama. And I ask a rhetorical question: Can we McCain voters, without embarrassment, shed a tear of patriotic joy about the historic significance of what just happened? And I offer a short, rhetorical answer. It also means a great deal that America’s first black President is not a grievance monger like Jesse Jackson or a race-baiting thug like Al Sharpton. Obama is an archetypal family man who exudes a sense of calm leadership and stresses personal responsibility, and who built a winning coalition by earning the support of millions of people of all races. Jackson, who as recently as 2006 was named America’s “most important black leader,” will never wear that mantle again, and America will be the better for it. As I’ve written before, it’s probably too late to surrender in Iraq — even though Obama’s support for doing so helped him win the Democratic nomination. Enough progress has been made that once it becomes Mr. Obama’s war, 76 days from now, he will not want to be the President who snatched defeat from the jaws of victory. Obama’s election will, at least temporarily, dramatically improve America’s standing in the eyes of the rest of the world. (I consider this to be similar to the redemptive benefit of electing a black President. It’s not reason enough for me to vote for Obama in a time of war, but that doesn’t mean I can’t be pleased by that part of the package.) When the time comes to respond to the next terrorist assault, President Obama will be more free of the phony unilateralist label than President McCain could ever hope to be. Despite holding the Presidency and both houses of Congress, the Democrats will be constrained in their ability to increase the size of government by the financial crisis that will take at least a year or two to unwind. The Obama Administration may well turn out, against its instincts, to be more financially conservative than the Bush Administration. Not a high hurdle, I admit. The manner of this political victory is important, as well. This was not some prize bestowed upon him, and Barack Obama didn’t just buy a winning lottery ticket; he out-smarted and out-worked both Hillary Clinton and John McCain. It is healthy that the American political system gathers the energies and talents of those who feel excluded into the nation to change it, rather than pushing them away from the nation to oppose it. Although I’ve written at length about his occasional appalling choices in associates, to me that always seemed much more of a blot on his judgment than on his own moral character. No person is without flaws, and no successful politician can always take the high road. But I believe President-Elect Obama — like the man he defeated — is fundamentally a good and decent human being with the capacity to be an inspirational leader. The fact that our political system gave us a choice of two such candidates may be the greatest silver lining of all. … and pray for his continued good health. I guess if I want to be a titan of the blogosphere I should take this more seriously, but I’m tired of the damned election. Even the much-anticipated All That Is Necessary endorsement will not be enough to help McCain in New Jersey. My collected election posts can be found here. A great moment: When the press was hitting hard on the pregnancy of Sarah Palin’s 17-year-old daughter, he did not respond with a politically shrewd “I have no comment,” or “We shouldn’t judge.” Instead he said, “My mother had me when she was 18,” which shamed the press and others into silence. He showed grace when he didn’t have to. There is something else. On Feb. 5, Super Tuesday, Mr. Obama won the Alabama primary with 56% to Hillary Clinton’s 42%. That evening, a friend watched the victory speech on TV in his suburban den. His 10-year-old daughter walked in, saw on the screen “Obama Wins” and “Alabama.” She said, “Daddy, we saw a documentary on Martin Luther King Day in school.” She said, “That’s where they used the hoses.” Suddenly my friend saw it new. 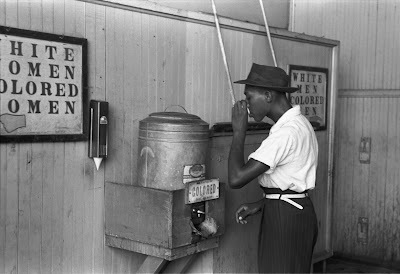 Birmingham, 1963, and the water hoses used against the civil rights demonstrators. And now look, the black man thanking Alabama for his victory. This means nothing? This means a great deal. I’m voting McCain because I believe he has a better understanding of the cost of meekness in the face of fascism. But Obama has demonstrated that he knows he can’t afford to be held hostage by the extreme pacifist wing of his party. Ironically, the success of the surge has worked against its champion, McCain. An Obama Presidency that might have been a disaster two years ago is much less frightening now that the advocates of surrender have lost interest in the war. For me, the redemptive potential of electing a black man as President is not a sufficient reason to support the candidate I consider less qualified to be commander-in-chief. But if Obama wins, my vote for the other guy will not prevent me from celebrating a joyous milestone. As Noonan wrote, this means a great deal. As bonus time approaches, Wall Street firms are trying to balance the need to retain key executives against concern about the “optics” of giving boatloads of bailout money to the people who arguably created the need for the bailout. In a sign that Wall Street is waking up to the political tempest over billions of dollars in year-end bonuses likely to be paid out at securities firms lining up for government infusions, top executives are in discussions to possibly cap their own compensation, according to people familiar with the situation…. “There are going to be some people in the financial-services industry who will show real leadership here and recognize the reality of the situation,” one senior Wall Street official said. At least one major firm has looked at former PepsiCo Inc. Chairman and Chief Executive Roger Enrico’s move in 1998 to give up his $900,000 salary. Instead, Mr. Enrico asked PepsiCo directors to fund scholarships for children of “frontline employees.” Mr. Enrico still got a $1.8 million bonus that year. Yes indeedy, “real leadership” — give up the high six-figure salary but keep the seven-figure bonus. And of course, the 1998 bonus of a soda-pop CEO is one or even two orders of magnitude lower than what is available on Wall Street in a good year. I have mixed feelings about this. I’m a fervent capitalist and I lean libertarian, so I believe salaries and other prices should be set primarily by markets, not by government decree. I toiled in the Wall Street vineyards for many years, mostly at Merrill Lynch, and I believe my old firm and its competitors play a crucial role in the economy. I was support staff, not a revenue producer, which meant my annual bonus was a fraction of my salary, not a multiple. But I never complained about executive comp, because when the poobahs got more money, so did the gumbies. But I suspect the best financial minds on Wall Street will continue to find ways to reward themselves handsomely. If such a limit could even be enforced realistically, it would simply drive the top talent into less-regulated pursuits. Do we really want to move the center of gravity of global finance out of the public securities firms and into hedge funds? So, what should be done about the admittedly scandalous prospect of paying zillions of dollars in bonuses with money ponied up by taxpayers? I dunno… that’s above my pay scale. Welcome, Andrew Sullivan and 3QuarksDaily readers. While you’re here, I hope you’ll take a look around and leave a comment! The “Labels” section in the right column can be used as a menu. 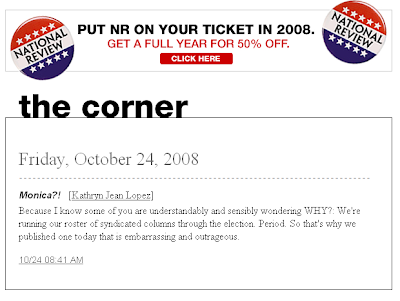 I’m a big fan of National Review Online’s group blog, called The Corner. It has been described as “the Id of Conservatism,” and it’s the first political blog I visit on most mornings. I visit multiple times on most days — there are a dozen or more contributors who participate with varying degrees of regularity, which means there is fresh content throughout the day. Kathryn Jean Lopez, known as K-Lo, is the Editor of NRO. She’s also the most frequent poster in The Corner, and serves as its “Mother Hen,” keeping her predominately male colleagues in line when they spin off on tangents such as Star Trek discussions. [Sexist metaphor alert: This post contains politically incorrect, gender-specific references, starting with the headline. What can I say — I’m a man, and men are pigs.] I disagree strongly with Lopez on social issues (she’s an anti-abortion absolutist and opposes gay equality), but I admire her work ethic and I admire, evaluated as a whole, the product she produces at NRO. In short, I’m not a K-Lo basher (cf. Sullivan, Andrew). But she made a cryptic post this morning that inspired me to drop everything and figure out what the heck it was about. She thereby called my attention to a column on her own site that she finds “embarrassing and outrageous,” and that I likely would not have seen otherwise. She doesn’t link to the column in question. Whatever could she be talking about? I had a hunch, but didn’t want to leap to a false conclusion. So I did some research. A month ago, Kathleen Parker became one of the earliest and most prominent conservatives to go public with a strong condemnation of the Palin selection, saying she should withdraw for the sake of the party and her country. Pundits and bloggers on the Left gleefully plastered links to the column all over the Internets, while a few on the Right did so more in sorrow than in anger. It is entirely possible that no one could have beaten the political force known as Barack Obama — under any circumstances. And though it isn’t over yet, it seems clear that McCain made a tragic, if familiar, error under that sycamore tree [McCain apparently “proposed” to Palin under such a tree — Ed.]. Will he join the pantheon of men who, intoxicated by a woman’s power, made the wrong call? Had Antony not fallen for Cleopatra, Octavian might not have captured the Roman Empire. Had Bill resisted Monica, Al Gore may have become president and Hillary might be today’s Democratic nominee. If McCain, rightful heir to the presidency, loses to Obama, history undoubtedly will note that he was defeated at least in part by his own besotted impulse to discount the future. If he wins, then he must be credited with having correctly calculated nature’s power to befuddle. K-Lo (and apparently some readers who corresponded with her) are outraged at the idea that Parker arguably has compared Sarah Palin with Monica Lewinsky, and by extension arguably has compared John McCain with Bill “Can’t Keep it Zipped” Clinton. One can certainly interpret the column that way, but I urge you to read the whole column and consider whether the Lewinsky/Clinton analogy is central to her thesis. I think Parker is on to something — it boils down to “men are pigs.” I don’t think McCain is nearly as big a pig, in the sexual sense, as Clinton… but I think an analogous dynamic is at work. It’s the best explanation I’ve seen for throwing caution to the winds and making the disastrous Palin selection. 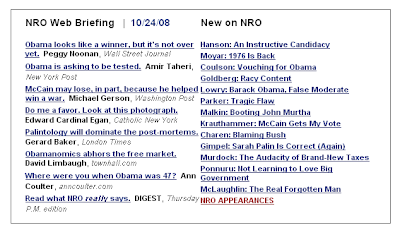 I’m not a Palin-basher either, btw, at least not in any absolutist sense… I criticized the choice the day after it was made (“The Five Stages of Adjusting to Palin“), then was wowed by her convention speech (pig that I am, no doubt) and tried to make the best of until Palin became too much of a national joke. Here’s a link to all of my Palin-related posts. When I adopted my blog moniker, I thought of it as a staggeringly obvious and overtly ironic joke. I was shocked to discover that it was taken absolutely seriously by the vast majority of bloggers and their commenters, and that it entirely colored their initial take on my observations. Simply, people pay much more attention to words coming out of the mouth of a Pretty Lady. They may reflexively deride those words, or fawn on them, but they are definitely responding to context, rather than content. Update: This post led to a Sullivalanche. Something not quite right metaphorically in that headline, but I’m too tired to figure it out. To win, Obama needed to refrain from burning an American flag onstage, and he more than met that challenge. He looked more Presidential than McCain. I’m trying as hard as I can to find reasons to stay on the McCain bandwagon, but when he gave that sarcastic “I got it” smirk at the end of the discussion on vouchers, I wanted to slap him. He also didn’t help himself by mocking Obama’s eloquence — even though he was making the valid point that Obama’s willingness to “look at” offshore drilling was a form of weasel-wording. I was astonished that neither candidate directly addressed the Palin issue in response to Bob Schieffer’s question about whether the respective VP candidates are ready to serve as President — and Schieffer didn’t follow up. McCain convinced me that he’s proud of Palin, but didn’t claim she is ready to serve. Obama could have gallantly confined himself to saying he thinks Biden is more qualified, but he didn’t even do that — he spun off on a tangent about funding for autism. I didn’t see the point of McCain coming back to bang on Congressman Lewis again after already making his point once. McCain has a legitimate grievance about Lewis’s remarks, but it’s hard to see how that helps him. And Ayers still is not a five-run homer. I liked McCain’s jibe near the beginning that if Obama wanted to run against George Bush, he should have run four years ago. But it was all downhill from there. Losing the Presidential race has to be even worse than losing the World Series. If you lose the World Series, you at least get to put up a banner proclaiming that you were the League Champion for the year. Your hometown throws you a consolation rally, and you start talking about the future (“hey, we’re tied for 1st place” in the coming season). There may be regrets about missed opportunities that could have produced World Series rings, but your own fans probably will not vilify you. McCain, however, can already hear the long knives being sharpened on his own side of the aisle. (Oops, wrong metaphor.) McCain knows the throw is going to beat him to the bag, but he has to be seen running it out just as hard as he can. This is the big leagues. Democrats enter the 2008 presidential race with powerful political advantages, but face a tough and unpredictable battle because of the vulnerabilities of front-runner Hillary Clinton. … She’s locked in a dead heat against leading Republican candidate Rudolph Giuliani. Flash-forward to October 2008. Now it’s getting late in the World Series, and McCain is badly behind. Real Clear Politics shows eight states as tossups (CO, FL, IN, MO, NC, NV, OH, WV). Even if McCain wins every single one of them, he comes up short of the 270 electoral votes he needs, unless he also can turn a blue state red. In baseball terms, McCain has made it to Game Seven of the World Series, but he’s down by five runs and he’s got nobody on base. It’s not the 9th inning yet, but it’s getting late in the game. So he tries to hit a five-run homer. “Hey, let’s pick that hot Alaska governess for VP.” (Note to the beautiful blonde I’m proud to call my wife: This isn’t me talking, Sweetie — I’m channeling McCain.) “That’ll shake things up and energize the base.” He knew Palin’s national credentials were thin (to put it charitably), but there was no way to predict she would become such a target-rich environment for Tina Fey. That move didn’t work out, and now it really is late in the game. He’s got his ace starter warming up in the bullpen on two days rest. He tries to bunt for a base hit with two outs, desperate to do something to get a base runner. Et cetera, et cetera — I don’t want to get overly tedious about matching baseball moves with specific McCain tactics, but I’m talking here about things like “suspending” the campaign, and announcing a half-baked, buy-individual-mortgages proposal in the second debate. What do you do now, Mr. World Class Athlete who has come so far? This ain’t no basketball game, where the last few minutes turn into garbage time when the game is out of reach. It’s still theoretically possible to win until the final out. … is the window these associations give on Obama’s core beliefs. He doesn’t share Rev. Wright’s poisonous views of race nor Ayers’ views, past and present, about the evil that is American society. 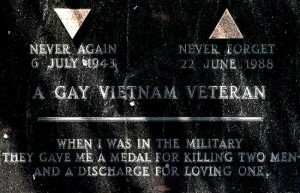 But Obama clearly did not consider these views beyond the pale. For many years he swam easily and without protest in that fetid pond. “Fetid pond” is a nice touch. But while this is a legitimate issue, it’s not a five-run homer — and meanwhile, McCain has his Keating Five baggage. I fear that McCain and the Republicans, in their understandable desperation, are going to ratchet up the negativity at the very time that people like me, who favor McCain despite his flaws, are trying to reconcile ourselves to Obama, despite his flaws. The economic crisis is driving votes to the Democrats. That may not be fair or logical, but it’s a fact. And the only thing that could possibly knock the financial crisis off the front page between now and Election Day would be an Unspeakable Event that I most fervently do not want, and that no loyal American wants. If such an event were to occur, it is not clear to me which way the votes would shift. Going negative can be effective at the margins, but it will backfire if the Republicans take it too far. Ayers is an unrepentant terrorist, but Obama is not. Rezko is a criminal, but Obama is not. Wright is an anti-American racist, but Obama is not. Obama also is not a Muslim or a Marxist or a Manchurian Candidate, and however fervently some people may believe those things about him, the umpires are not going to be convinced. Out of all the people who have any conceivable chance of winning the election next month, Obama to my mind is the second-best choice. I have serious qualms about him, but there is an upside as well, and I have no doubt the Republic will survive an Obama Presidency. To paraphrase the best thing Al Gore ever said, during extra innings in December 2000, “if at the end of the day, [Obama] is sworn in as President, then he’ll be my President. He’ll be America’s President.” To which I would add, let’s treat the man with the respect the office deserves.